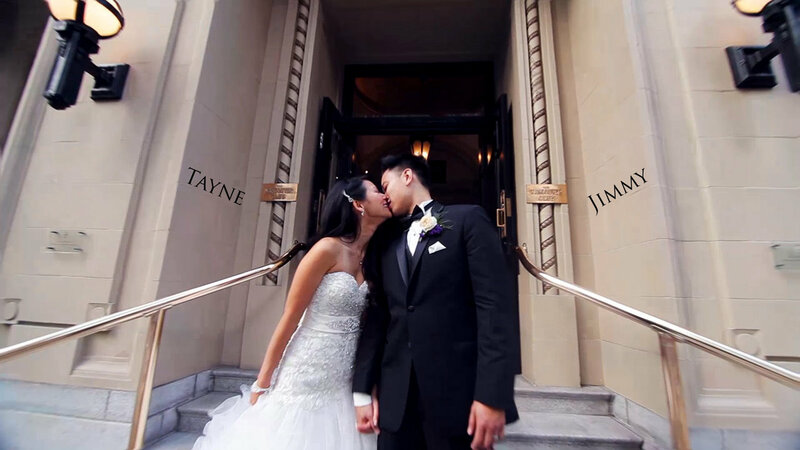 Wedding Cinematographer Tayne and Jimmy Same Day Edit Video – Elegant and Romantic Wedding – Vancouver Wedding Videographer Life Studios Inc.
Life Studios Inc. was honoured to film and photography Tayne’s and Jimmy’s grand, elegant and romantic wedding! “I cannot wait to hold you again in my arms and know that you are now mine for eternity. I love you so much, Jimmy,” writes Jimmy to Tayne in his card, bringing tears to Tayne’s eyes at the incredibly sweet words to start their perfect day. Jimmy and his groomsmen were subjected to hilarious Chinese bridal door games where Jimmy and his groomsmen had to catwalk dressed in thongs and re-enacted the proposal, among many other embarrassing tasks. After getting ready, Tayne and Jimmy had a first look in Stanley Park where they shared a sweet and private moment before the touching ceremony. The ceremony and reception were held at the stunning Vancouver Club. We absolutely love filming here as the venue is absolutely beautiful and always makes for the perfect backdrop for a love story to happen. “Till this day I pinch myself to make sure that I’m not dreaming. I will do everything in my power to keep you happy,” promises Jimmy. “This journey that we are going to take will not be easy at times but I want to do that because I want you” Tayne vows in return during the heartfelt ceremony. In the full room, Tayne and Jimmy only had eyes for each other. The reception followed which sparkled with the gorgeous crystals, flowers and white decor that decorated the room! Tayne’s and Jimmy’s smiles throughout the entire day spoke volumes about how incredibly happy and in love they are! We wish them all the best and could not be happier for them! Smile and be touched by the Wedding Cinematographer Tayne and Jimmy Same Day Edit Video!